JohnDow Industries re-introduced its Smart WallStorage Solutions systems. 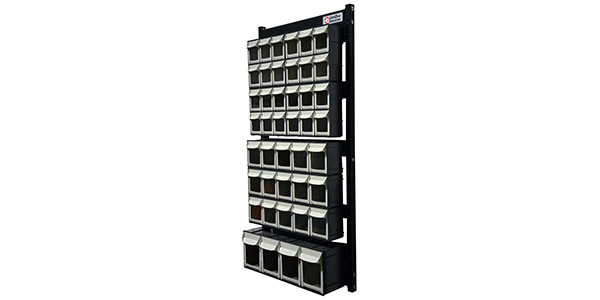 The Smart Walls are designed as a better option for the storage of popular service parts, making them easy to access, easy to find and easy to organize. It is not necessary to lose a minute of productivity looking through overflowing boxes and cluttered shelves and at the same time maximizing available storage space. 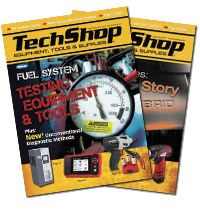 All of these benefits will impact the bottom line of the shop owner — fewer idle service bays, less wasted technician time resulting in improved productivity and increased profits. Each Smart Wall consists of a series of tip-out storage bins that mount to a heavy-duty wall frame. The wall frame includes two slotted wall standards with top and bottom connecting bars. The Smart Wall is designed specifically for small parts like wheel studs, lug nuts, oil drain plugs and gaskets, fuses, nuts and bolts, etc. The heavy-duty steel wall frame includes a durable powder-coat finish. The compact design of all three units measures 38 in. W x 10 in. D x 50 in. H. The tip-out bins are made from tough ABS plastics with a transparent window and label holder. Bins can be easily moved and expanded to accommodate new parts and replacement tip-out bins are also available.